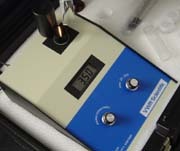 Accurately measures the quantity of suspended particles in a clear liquid, up to 200 NTU. Usable either in the laboratory or field using a rechargeable, 12V battery in a carrying case. Meets EPA water measurement specifications.